The Democratic Party brain trust is floating new ideas on taxes. Their economics are questionable and their politics are worse. From the heart of Barack Obama’s exiled brain trust comes Jason Furman, former head of Obama’s Council of Economic Advisers, with a proposal in the Wall Street Journal to “repeal and replace” the recent Trump/Republican tax cuts. How do his ideas compare to alternatives that might appeal to readers of this journal — not to mention the vast legions of Berniecrats and The Resistance? Furman’s analysis provides a useful window into the concerns of financial elites. To be fair, he takes aim at certain sources of tax relief for the rich, including those related to capital gains and “pass-through” entities (a form of business organization often used by medium-to-large-sized companies). In general, however, he prioritizes deficit reduction and a lower tax burden on corporate capital. In short, if Furman’s views are any indication, when it comes to tax policy mainstream Democrats have learned nothing and forgotten a great deal. Furman’s point of departure is the impact of the Trump tax cuts on deficits. He glosses over the question of whether the current deficit is too high by referring to projections of its long-run trajectory. The deficit-hawk mantra always goes, “If nothing is done, in sixty years.…” The fallacy here is that something is always done. Things that can’t continue, don’t. Furman admits as much himself. The real question is what to do now. It’s worth remembering that the last time a Republican was in the White House, we heard exactly the same laments from liberals about “budget-busting” tax cuts. In 2003, Paul Krugman argued that “the government of the United States faces a fundamental fiscal shortfall” due to the Bush tax cuts, a problem so serious that Krugman called it a “planned crisis” that could be masked “for a while, by running huge budget deficits,” but that would eventually wreak economic havoc. At the time, the CBO was projecting that federal debt in 2013 would hit 14.4 percent of GDP. By the time 2013 rolled around, a deep recession had intervened and federal debt actually stood at 72.6 percent of GDP. Rather than wreaking havoc, though, the higher deficits were actually providing crucial support to the economy, and Krugman was arguing that even bigger deficits were needed. The lesson here is that when it comes to liberal finger-wagging over imagined future deficit crises — even under Republican presidents — the watchword should be: fool us twice, won’t get fooled again. Regressive tax cuts should be opposed because they’re regressive — not by pointing to a coming fiscal Armageddon. The remainder of Furman’s piece addresses what a desirable tax system would look like, and more specifically, the best ways to expand tax revenues. From the Left’s point of view, priority should be given to shifting the tax burden from labor to capital, from consumption to saving, and from low- and middle-income households to higher-income households. One of the strongest weapons in the capital-tax arsenal is the corporate income tax (CIT). 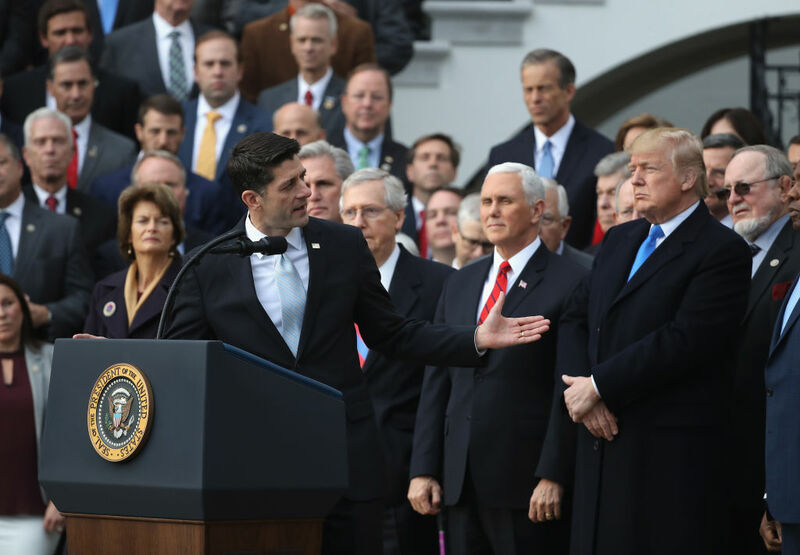 The 2017 Republican tax cuts made the CIT a chief target, cutting the rate from 35 to 21 percent and granting new opportunities for individual income-tax avoidance in the name of tax relief for small business. While defending the need to restore some CIT revenue, Furman skates past the idea of restoring the rate to 35 percent and invokes the general idea of broadening the tax base, without specifics. This is hardly surprising: the Obama administration was also prone to dismay over the alleged ill effects of the old 35 percent rate on competitiveness. The most egregious element proposed by Furman is what’s called “full expensing” of new business investment. Like many mainstream economists, Furman regards capital taxation as inherently inefficient, and a switch to full expensing would amount to cutting the capital tax rate to zero. The most notorious feature of the Trump cuts was the new tax advantage provided for what are called “pass-through” entities: businesses whose profits go untaxed except at the level of the individual owners. Furman, like other centrist Democrats, would dispense with the pass-through breaks while raising taxes on capital gains, and he also suggests restoring revenues by means of a new value-added tax or carbon tax. Both would amount to new taxes on consumption and increase income inequality. A dicey issue is raised when a tax break disproportionately benefits higher-income taxpayers but also helps many others. Two examples with immediate relevance are the exclusion of employer-provided health insurance from taxable income, and the deductibility of state and local income tax. In a dubious appeal to tax fairness, Obamacare included a “Cadillac tax” on high-value health insurance policies — an exception to the standard tax break for employer-provided health insurance. The tax was designed in part to encourage the spread of skimpier health insurance, on the nefarious theory that increasing out-of-pocket health care costs will induce workers to use care more “wisely.” And since generous health insurance is a major advantage of membership for many unions, the Cadillac tax was vociferously opposed by labor. The Republicans want to eliminate the Cadillac tax a) because it’s a tax and b) because it’s part of Obamacare (though their tax bill will actually increase the number affected by it). Furman, meanwhile, suggests an increase in the tax. As for the long-standing state and local tax break, the Republican bill scaled it down to help pay for their business tax cuts. Due to deficit concerns, Furman goes wobbly on the matter of restoring the deductions, while others of a centrist persuasion have spoken approvingly of eliminating them altogether. A full-bore assault on capital via the tax system would cover all returns to capital — which can take the form of corporate profits, capital gains, interest, rents, and royalties — and regardless of a firm’s size or legal status. It would include efforts to reverse the shift in firms’ ability to avoid the CIT altogether, and it would seriously beef up the IRS’s resources dedicated to curbing tax evasion. (About one dollar in six of federal tax liability is either not paid on time or paid ever.) Rebuilding the estate and gift tax is another priority. Thanks to the labyrinthine nature of law governing taxation of estates, much capital income escapes tax altogether. To recap: Tax reform is more properly about inequality than about funding public spending. And piecemeal expansions of the tax burden with a superficial nod to equality can have perverse implications.